It was a public humiliation for Muslims that none of the obsequious delegates from Muslim vassal states dared remind Trump about how his pejorative remarks about Islam, not just ISIS, have generated such global hysterical angst about Islam and Muslims. ISIS has been vehemently condemned universally by Muslims. Mainstream Muslims have made a repeated plea not to be broad-brushed with the diabolical terrorists. Muslims have also desperately engaged to extirpate this heresy from their religion. Yet through it all, Muslims have failed to remind the “current world order” that while an aggressive military approach demanded an immediacy of action, a multifaceted strategy based on social, educational, political, economic and above all a religious reform with the universal message of Islam is the key to expunging the heresy of ISIS and others of its ilk from Islam. For practicing Muslims, these goals are their imperatives to reclaim Islam. If implementation of these goals requires the assistance of like-minded law-abiding citizens of the world, so be it. It has to be the world against ISIS. Nothing short of that would work. With Muslim countries exterminating one another and the U.S. profiteering from permanent wars (in other countries’ backyards, with blow back always lurking in the wings), it is not surprising to read the headline, ”Trump: Israelis and Arabs share ‘common cause’ against Iran.” This may help to placate Israelis and bring some measure of “peace” between Arabs and Israelis for a time, but at what cost to the stability and welfare of the entire Middle East? There is also the rising tide of random acts of terrorism elsewhere by those who would have lost everything and have nothing more to lose. Despite Trump’s confrontational rhetoric, Iranian President Hassan Rouhani’s response was the hope that once the Trump administration had “settled down,” it would try to understand Iran better. If Trump does view Iran as a powerful ally in the showdown with heretical cults such as ISIS and can form an allegiance with Russia, Turkey, Saudi Arabia and Iran, he will be more likely to broker a peace deal with Israel and Palestine and pulverize ISIS. This would not be possible if he cavorts with contemptible nations that command nothing but visceral loathing by their adversaries who include ISIS, their arms suppliers in the West, their Shia counterparts and the overwhelming majority of peaceful Muslims living under their oppression. The alternative to this bold alliance and comprehensive strategy is an endless war initiated, sanctioned and bankrolled by the U.S. This will not make America great again, but it will make the entire world a lot less safe. Dr. Abdul Cader Asmal, MD, PhD, is the former president of the Islamic Center of Boston and the Islamic Council of New England, and director of the Cooperative Metropolitan Ministries. Craig Considine is a faculty member of the Department of Sociology at Rice University in Houston, and is author of the forthcoming books, Islam, Race and Pluralism in the Pakistani Diaspora (Routledge, July 2017), Between Muhammad and Jesus: A Catholic’s Love of Islam. 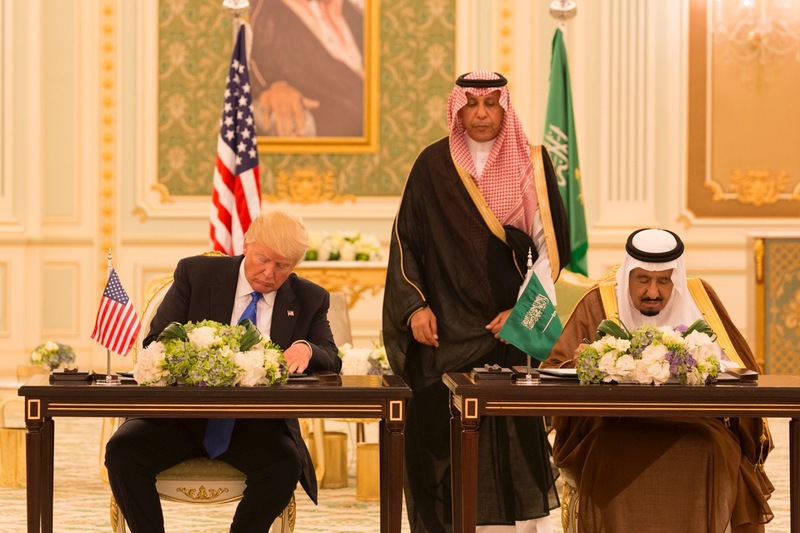 *Image: President Donald Trump and King Salman bin Abdulaziz Al Saud of Saudi Arabia sign a Joint Strategic Vision Statement for the U.S. and Saudi Arabia. Flickr/NinianReid.